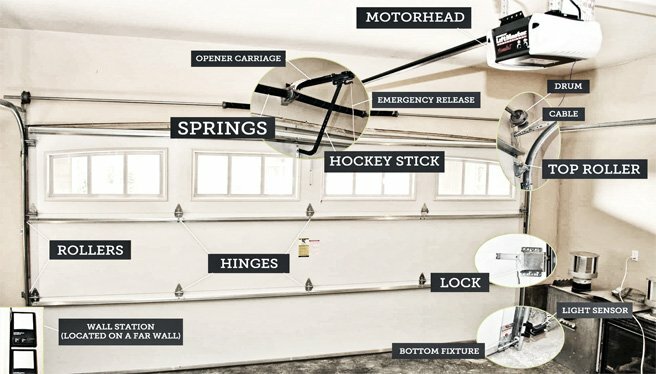 How to Troubleshoot Garage Doors? Having trouble with your garage door? If you want to fix it yourself, it is important to understand how the mechanism works. It is not the only type of garage doors, there are also one-piece and roll-up models, but we have chosen sectional doors, as they are the most popular ones. As the name suggests, these doors are made of sections. Typically, they contain from 3 to 8 panels. In residential areas, 4 or 5 sections are more common, but many coach houses built recently have 3 panels. The number of panels in commercial and industrial models often equals 7. In this situation, 24″ high panels are normally chosen, so that the doors could be used for large machines. Doors of this type open vertically, they slide up and overhead. Sections are suspended under the ceiling, which gives the owner a chance to make full use of the space. There are hinges along the length of every panel. These hinges hold the rollers in place and hold the panels together. Doors slide up and down in vertical tracks that are fixed on the opening with jamb brackets. The vertical track is also involved in this process. Graduated track brackets installed on the vertical track keep the bottom of the track nearer to the jamb while the higher-numbered brackets hold the top of the track further away from the jamb. This type of mechanism was first patented by Overhead Door Corporation. The top panel has a top fixture (also called top bracket) at the end. Its function is to keep the roller in the track. In the same way, there is a bottom bracket (fixture) at each end of the bottom panel. In comparison to a monolithic door, sectional garage doors take the same amount of space inside the garage. However, they do not require any space outside, so the car may stop very close to the garage. Sectional doors are also more reliable, as each section has its own connection to the track. The most common materials used in garage door manufacturing are steel, aluminum, wood, copper, glass, and vinyl. Several terms may be used to call doors of this type. “Garage doors” is the most widely used term, but professionals often call them “sectional doors”, in contrast to roll-up doors or one-piece pedestrian models. One more widely used term is “overhead door”. It refers to a full-size door used for road trucks. Also, such terms as “parking garage doors” or “overdoors” are sometimes used. Some makes of garage doors boast exceptional reliability. However, even the most reliable door can stop operating properly. In many cases, problems can be resolved by a homeowner. To start with, you need an easy-to-use troubleshooting guide. This is exactly what you will find on this website. It is designed to help you fix your garage doors, whatever the issue. There are troubleshooting tips concerning different types and makes of doors. You will find detailed instructions and explanations for do-it-yourselfers as to how to diagnose the malfunction and replace the worn parts keeping the doors from functioning properly. We recommend that you take care of any problem, even a minor one, at the earliest opportunity. The sooner you troubleshoot the malfunction, the less likely you are to be stuck outside under most unfavorable circumstances. Garage doors that do not seal provide anyone with an easy access to your home!